Yeah, developers Carbine know that spending resources on a video that is just about how the characters in Wildstar move seems a little odd. It should be trivial, but actually, given that this is an MMO, there’s quite a bit of extra stuff going on in here, specifically the addition of a platform-game style double jump, and a TPS/FPS type metered sprint function. There’s also a “dash” function for dodging. Doesn’t that make it a dodge function and not a dash? I mean I guess dodging is in a context. You can dash whenever, and it only becomes a dodge when you are dodging something. Yeah. Movement: with more philosophical legs that you might expect. It’s moderately amusing! I hope the game manages to be moderately amusing. Few MMOs are funny in any way. At least not on purpose. Anyway, there’s a beta going on. If Wildstar existed back when WoW had me pinned under its hulking gorilla girth, I think my head would’ve exploded. It has pretty much all the things every fiber of my hunched, addiction-ravaged being could’ve wished for – and then some. Player housing? You betcha. Customizable guild death lairs? Oh my yes. Highly mobile combat? Try standing still and find out. Bizarrely out-of-place anime bunny people? Well, they can’t all be winners. But you get my point. Its personality reminds me of less obnoxious 3D-animated kid films, too, and it definitely has heart. I can practically feel Past Me grossing up his portion of the space-time continuum with puddles of anticipatory froth. Current Me, though? He’s living in a post-WoW world, and he’s got a family of largely inconsequential desk cacti to be responsible for. Is Wildstar’s take on the tried-and-true MMO formula too little, too late, even with a generous helping of all the things? Perhaps the now up-and-running closed beta can help us find out. While the beta hasn’t opened its floodgates to everyone yet, Carbine’s still encouraging new applicants to put their names in the crazy purple curly-horned hat. Apparently, the plan is to expand pretty substantially in the coming weeks. 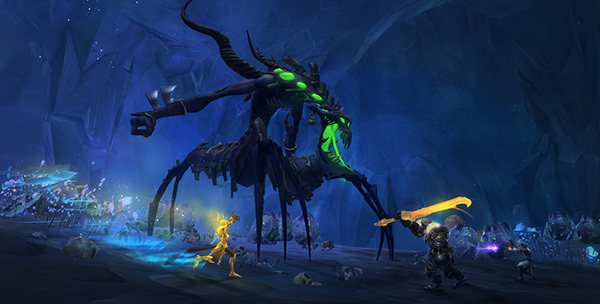 I’m looking forward to having a look around myself, too, as Wildstar seems incredibly well-thought-out for what it is. That fact, of course, isn’t entirely surprising given a pedigree that’s littered with Blizzard and Mythic veterans. Then again, I also desperately want to see MMOs reach new, different, less-grindy heights, and I’m not sure if any of Wildstar’s four patented paths will lead us there. That said, there’s a place in this world for comfort food, especially when it’s cooked up with a near-perfect blend of down-home ingredients. It certainly seems like that’s what Carbine’s going for, but I suppose there’s only one surefire way to find out. Who else is hoping to give the beta a try?Easy to spin Wildstar gold. This entry was posted in Wildstar. Bookmark the permalink.